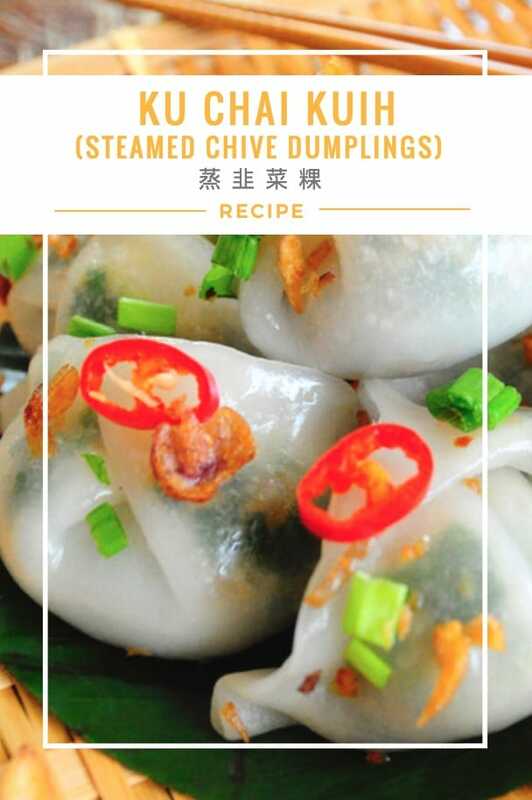 Ku Chai Kuih or Teochew Chive Dumplings is also known as Teochew Hun Kuih. 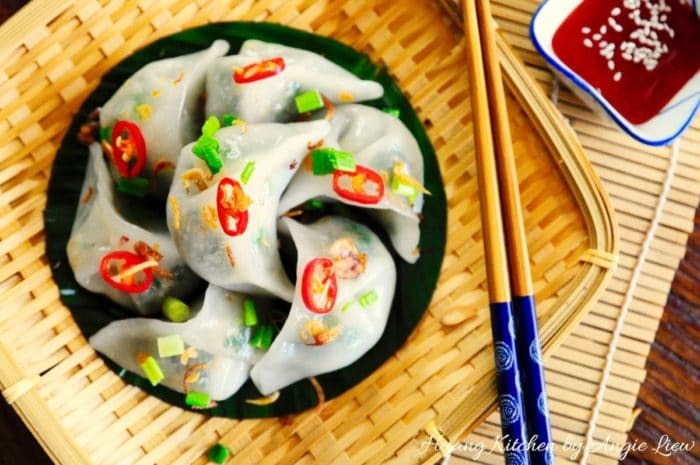 These dumplings are steamed, hence making them a great healthy yet tasty and light snack. Not to forget, it’s also my family’s all time favourite snack. Growing up in a Teochew family, I have always enjoyed my mum’s home cooked teochew delicacies. And this type of dumplings always rekindle fond memories of her and is very close to my heart. 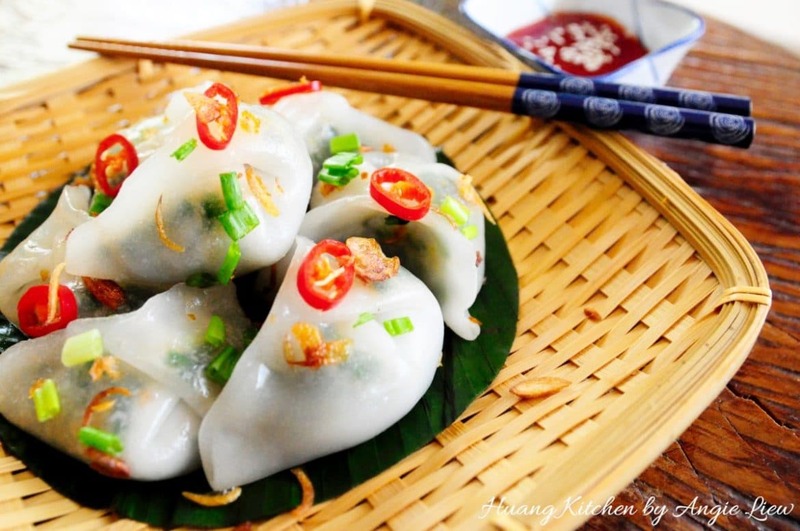 The traditional Teochew Chive Dumpling is made using either rice flour or tapioca flour. However, those commonly sold and popular today are mostly made with wheat starch which yields the signature transparent and crystal like skin. The skill in making Ku Chai Kuih actually lies very much in making the skin. 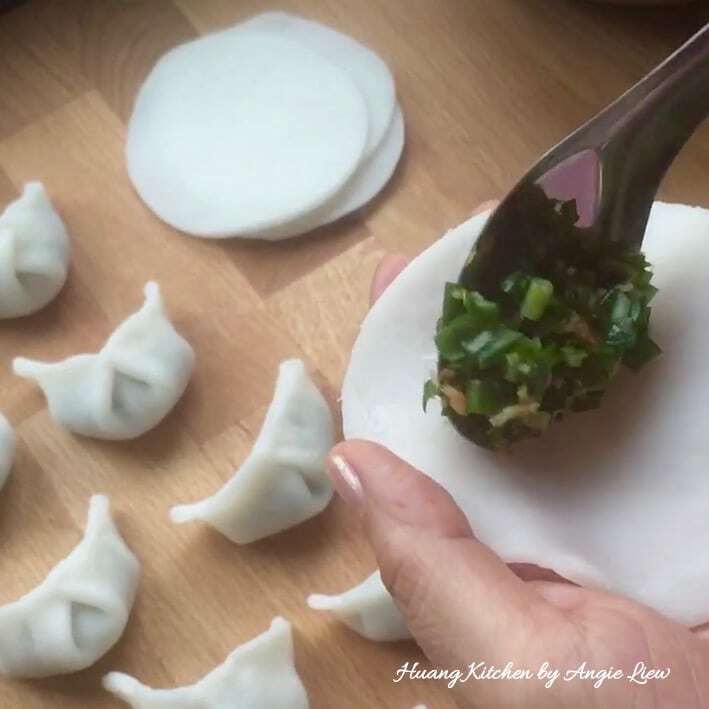 On steaming the dumplings, it should become transparent and has a soft, chewy texture. 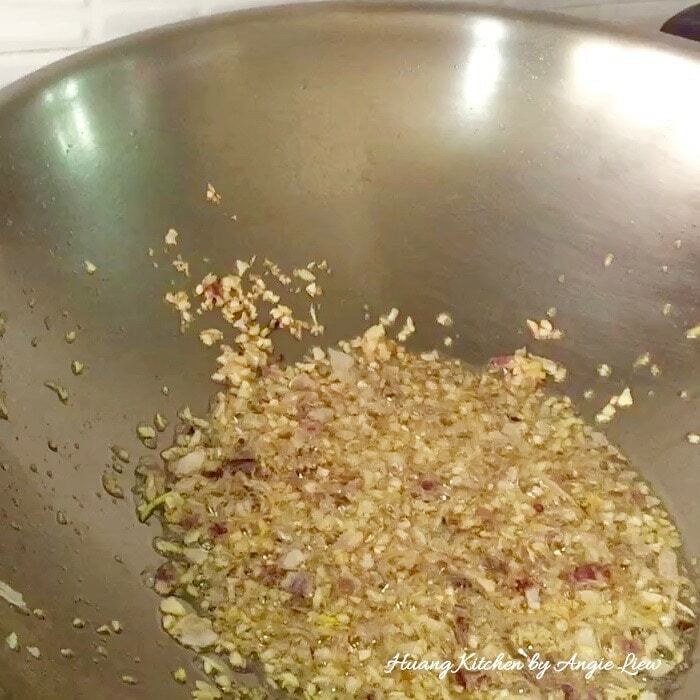 The main ingredients for the dumpling’s filling consist of only chives and dried shrimps. Sometimes the best taste does come from the simplest of ingredients. 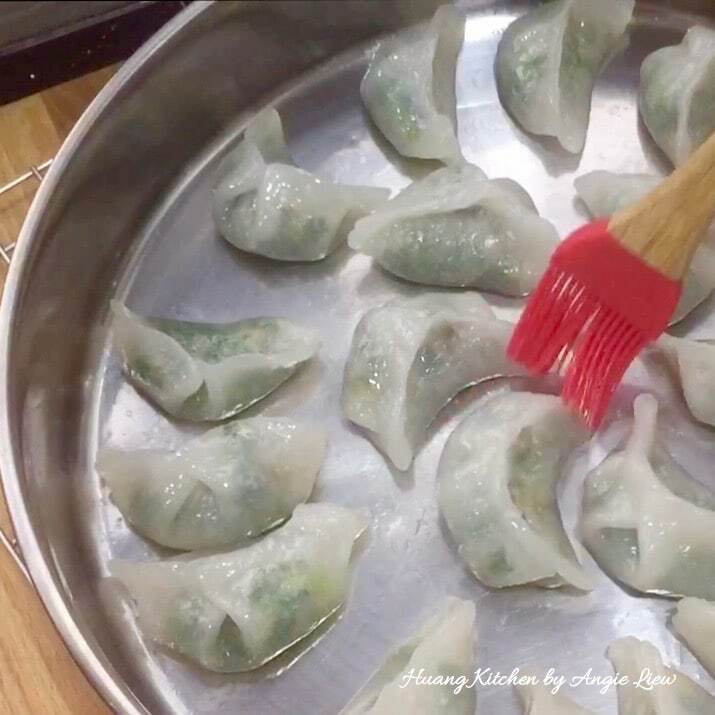 The fragrance of garlic chives and the savoury aroma of dried shrimp enrich the overall taste of this steamed dumplings. 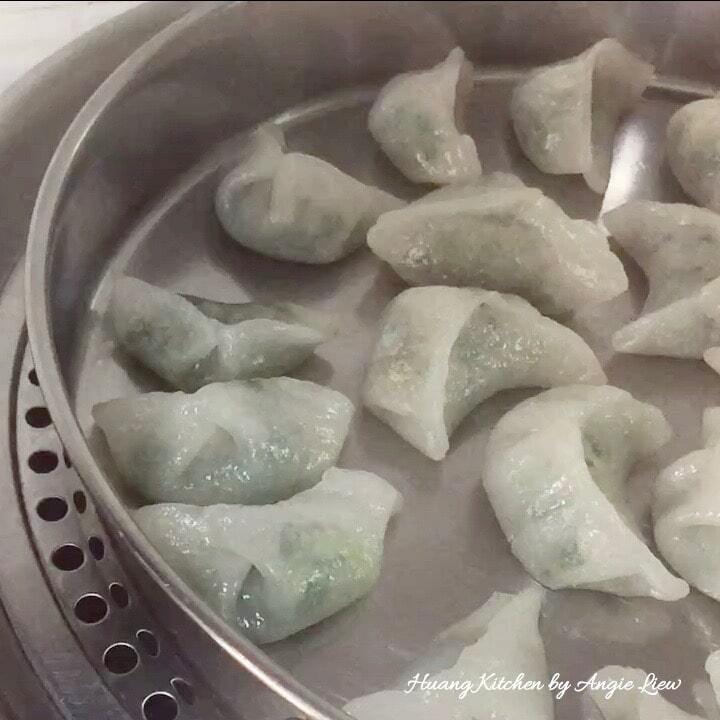 In addition, the emerald hue of chives can be seen under the dumpling’s translucent skin making it look so appealing and appetising. You will not stop at one, that I can assure you. 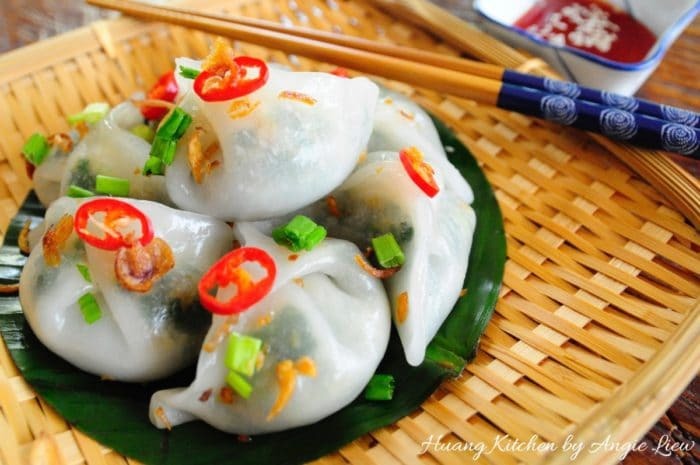 Ku Chai Kuih or Teochew Chive Dumplings is also known as Teochew Hun Kuih. 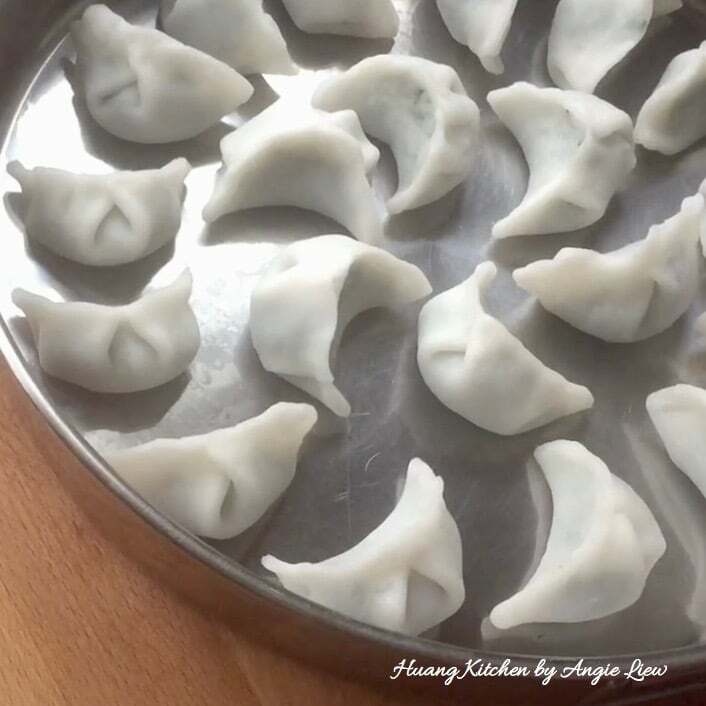 These dumplings are steamed, hence making them a great healthy yet tasty and light snack. 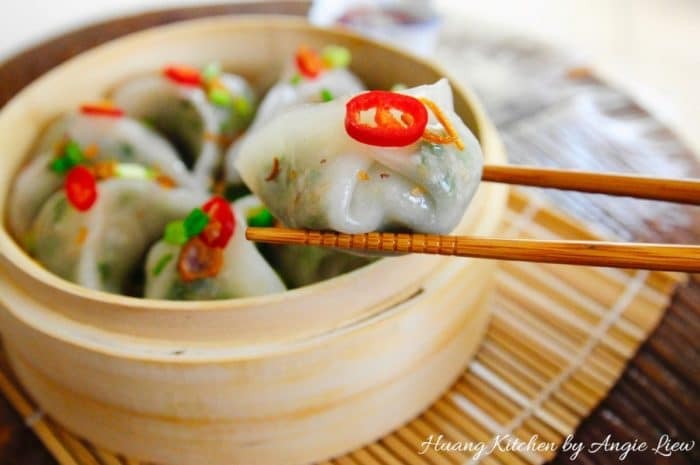 The main ingredients for the dumpling's filling consist of only chives and dried shrimps. Start by preparing the filling. Wash thoroughly the fresh chinese chives and drained welling a colander. Trim off the white part at the bottom of chives. Then cut the chives into 1/2 cm long pieces. Then set aside. Next, peel and chop garlic and shallots. Soak, drain and chop dried shrimps. Heat a wok with vegetable oil over medium-high heat. 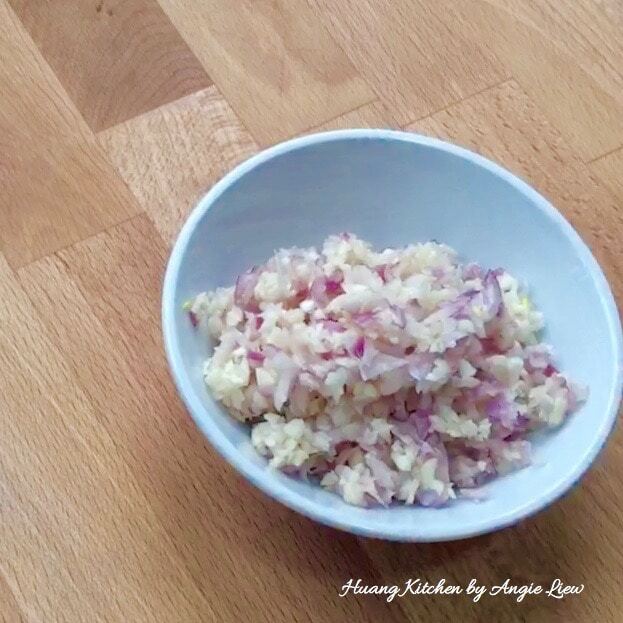 Add chopped garlic & shallots and saute till fragrant. Then, add in chopped dried shrimps and stir-fry until dried shrimps turns golden brown and fragrant. Then remove from wok. 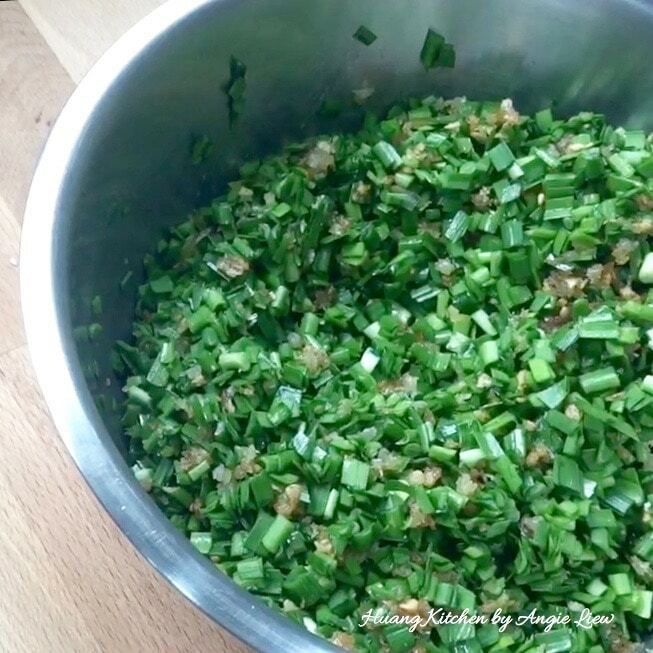 Toss the fried shallots and garlic in the fresh cut chinese chives. 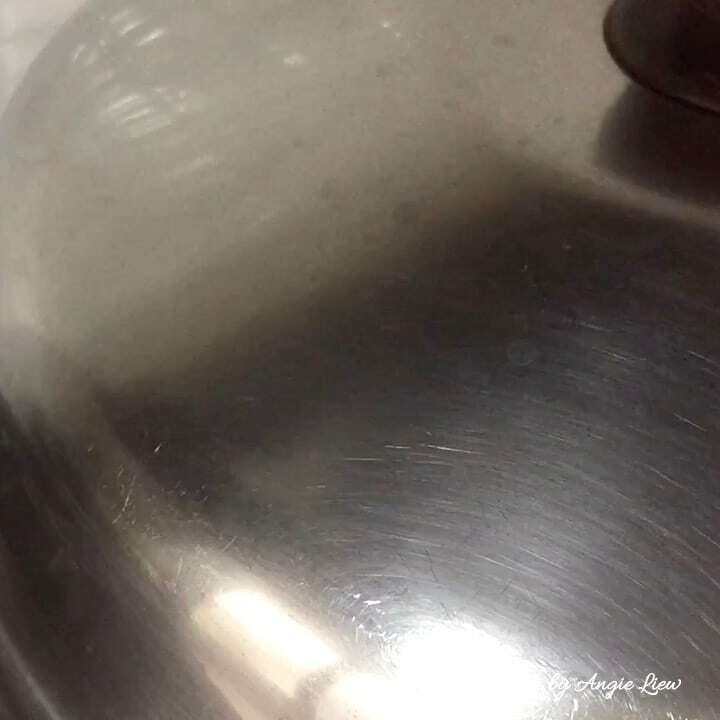 Then add in a tsp of alkaline water. This will help keep the chives green. Be sure they are well mixed. Set aside while we make the skin dough. 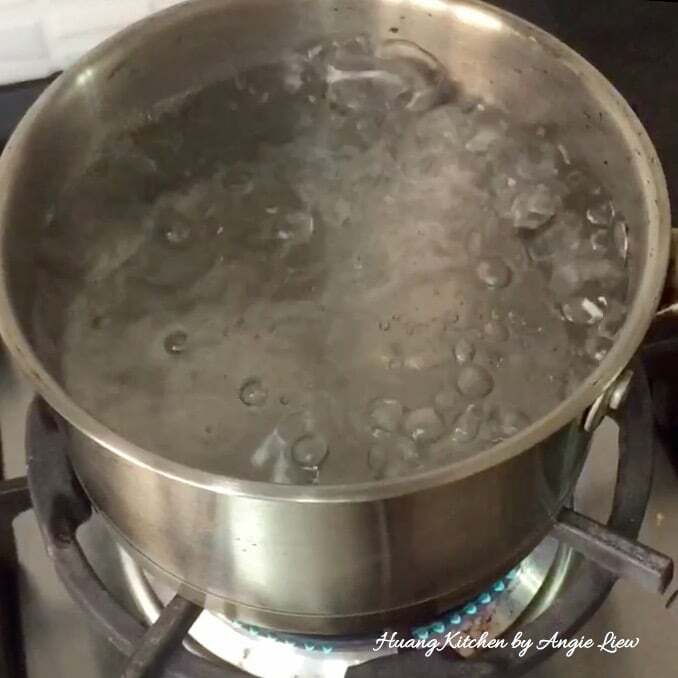 To make the skin, first bring a pot of water to a boil. 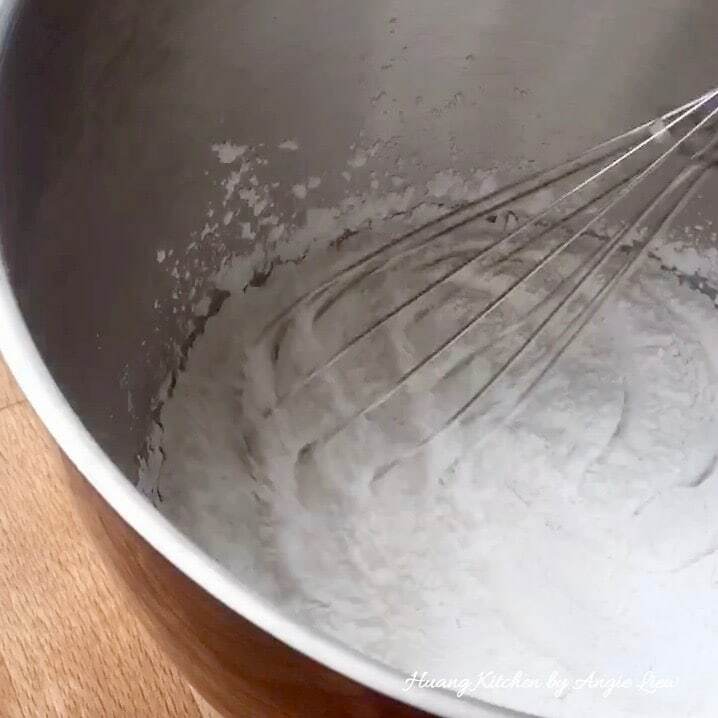 In a large mixing bowl, add wheat starch, tapioca flour, salt and sugar. 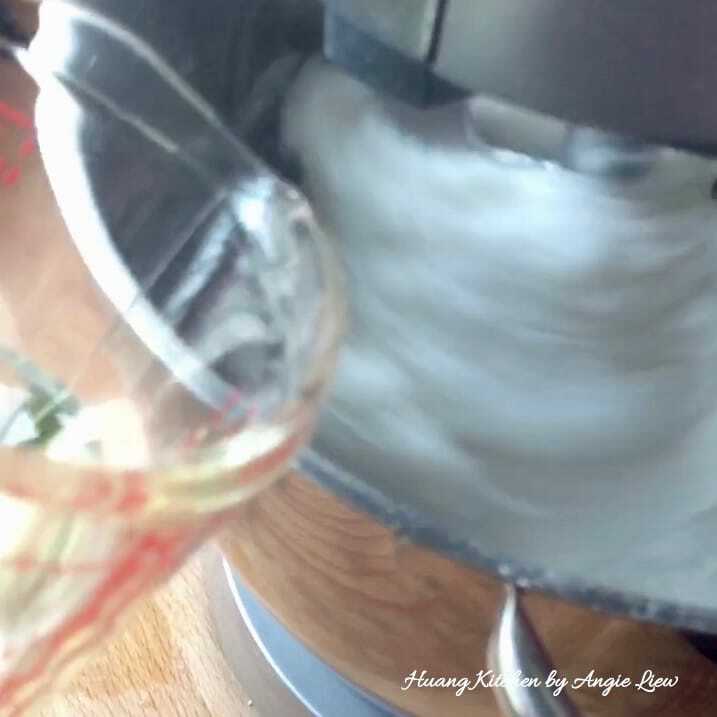 Whisk to combine well. 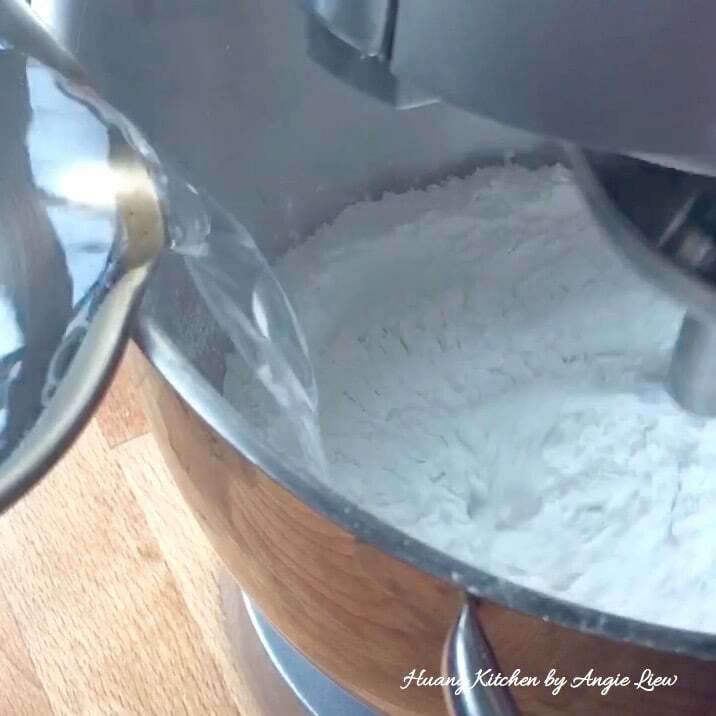 Quickly add in the boiling water and using a dough hook, stir until the flour mixture comes together. Then, add in vegetable oil and continue to knead until a smooth dough is formed. Remove from mixer. 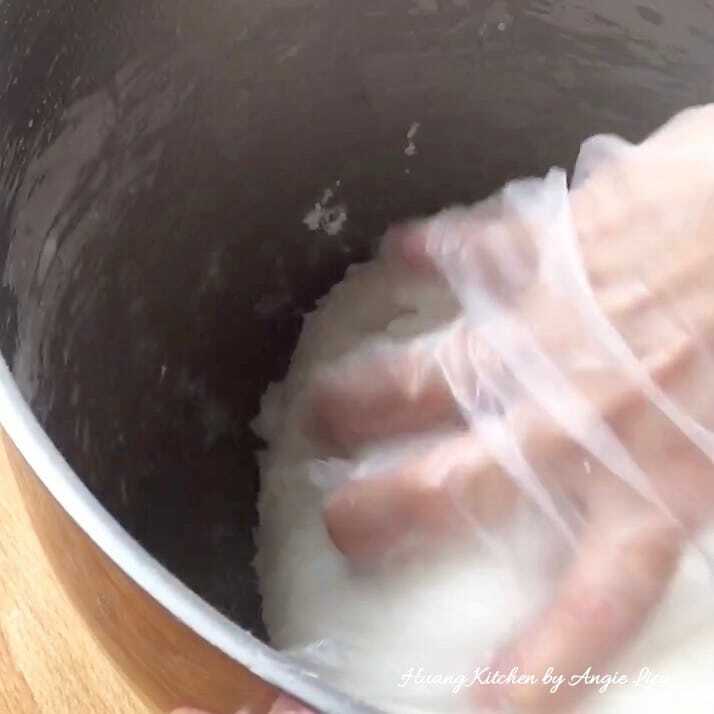 Briefly knead the dough with your hand for the last time. Divide the finished dough into smaller portions and set aside to rest for about 15 minutes. And we're ready to make the chive dumplings! 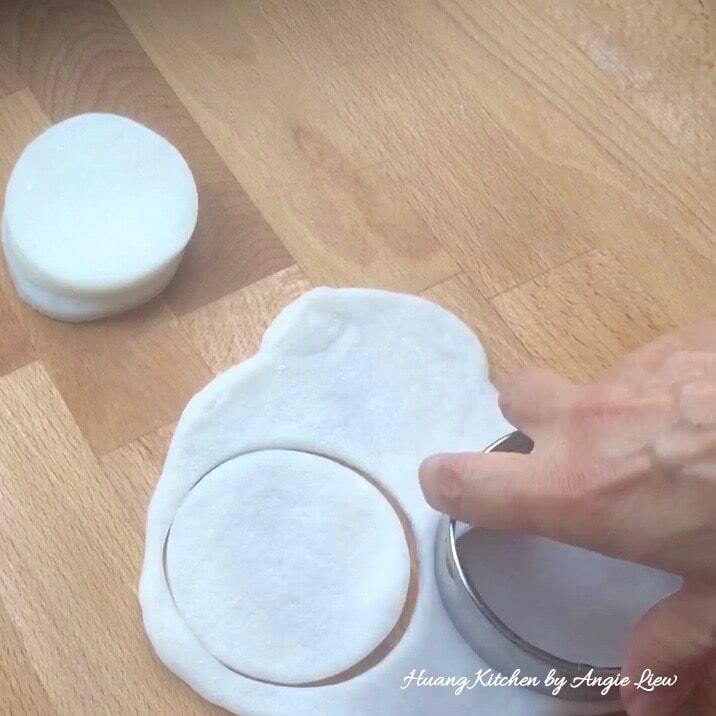 First, lightly dust the working surface and rolling pin with some flour. 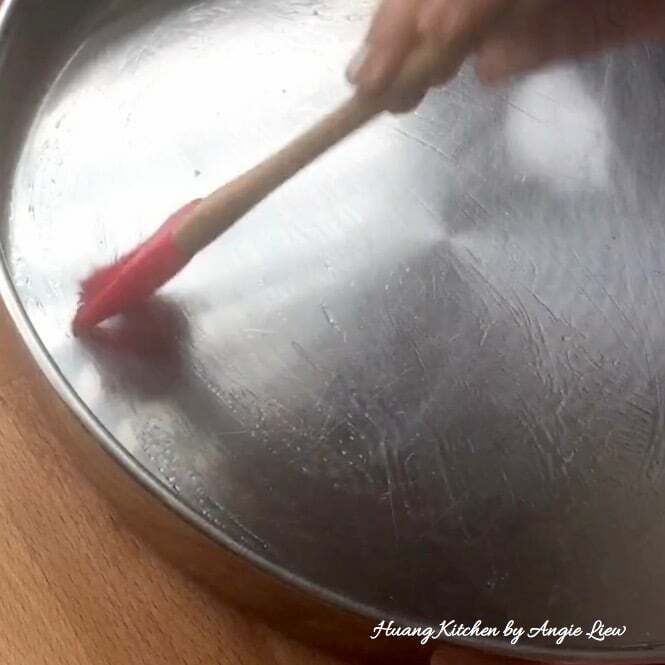 Then roll out the dough into a thin layer. 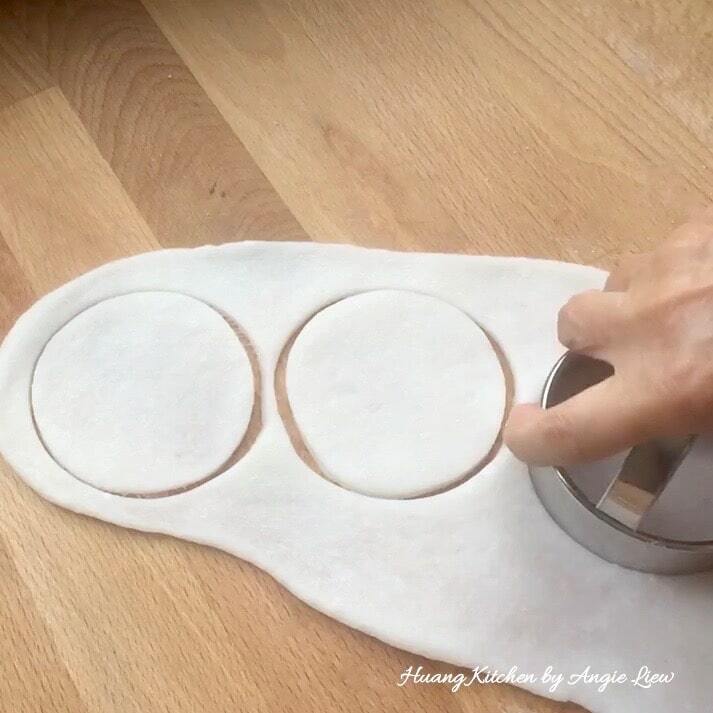 Using a cutter, cut into round wrappers. 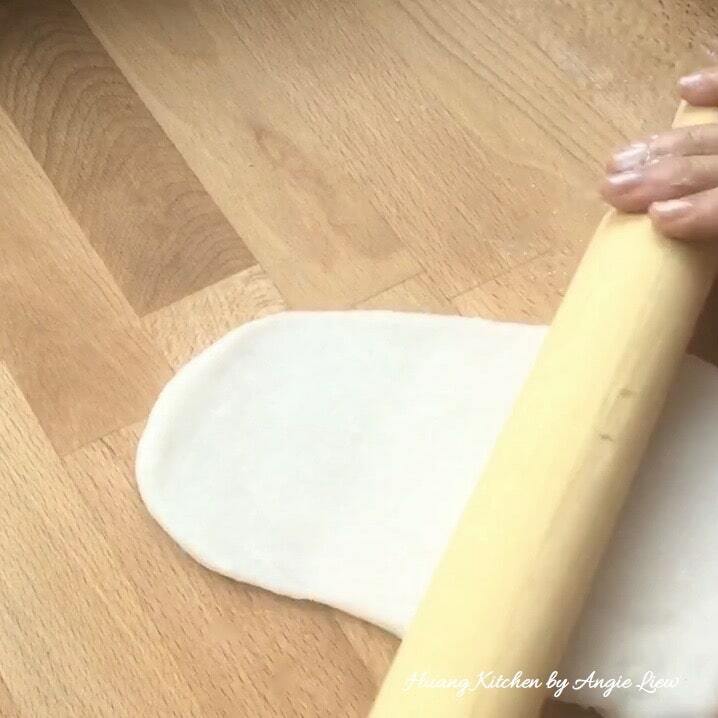 Continue to roll out balance of dough and cut into round wrappers. And we're ready to wrap the dumplings! To make the dumplings, first spoon 1 heaping tbsp chive filling into the centre of wrapper. Pinch the centre of wrapper tightly to seal. 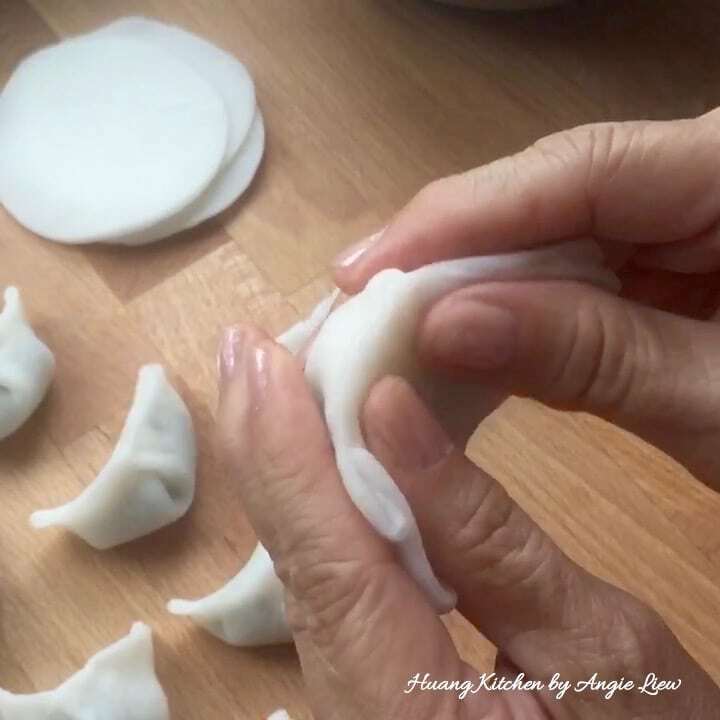 Next, pinch the lower half (right side) of dumpling to seal. 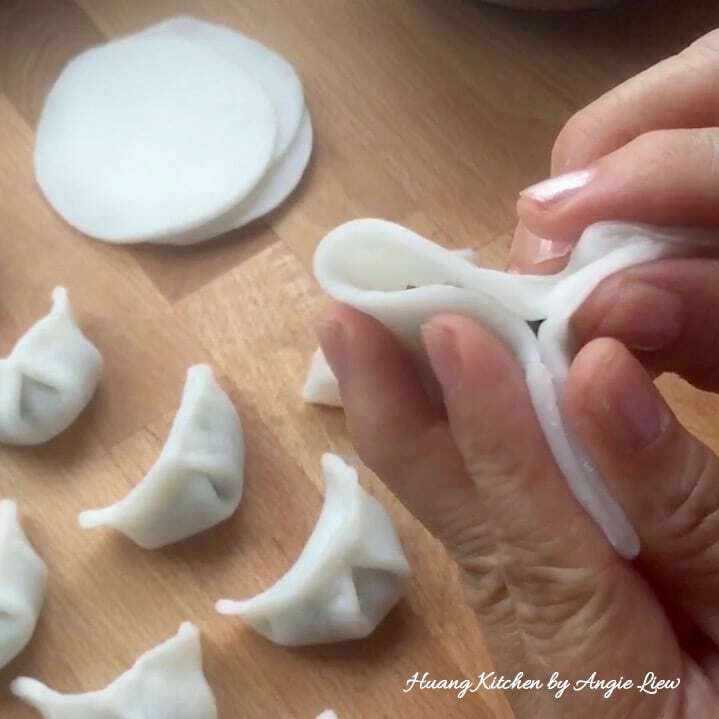 Then, bring the upper half (right side) of dumpling forward and press to seal. 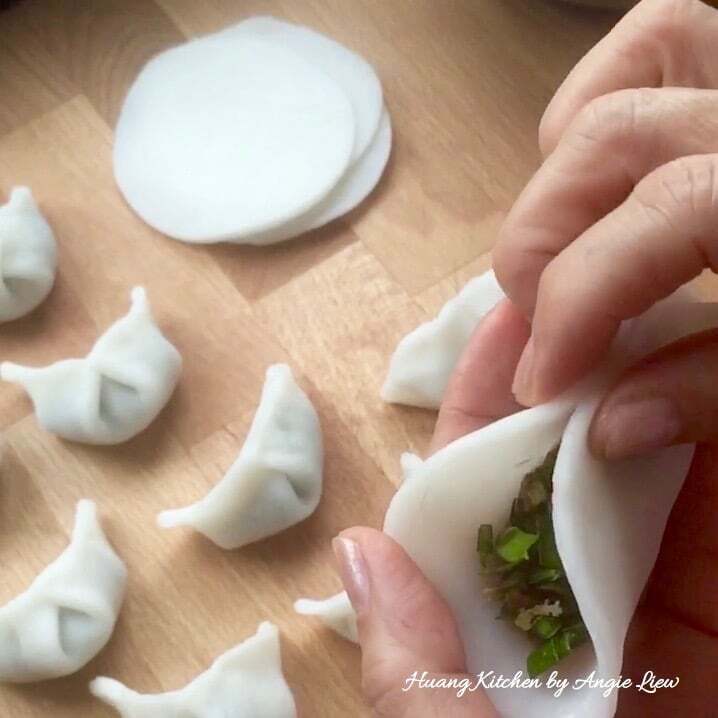 Next, pinch the lower half (left side) of chive dumpling to seal. 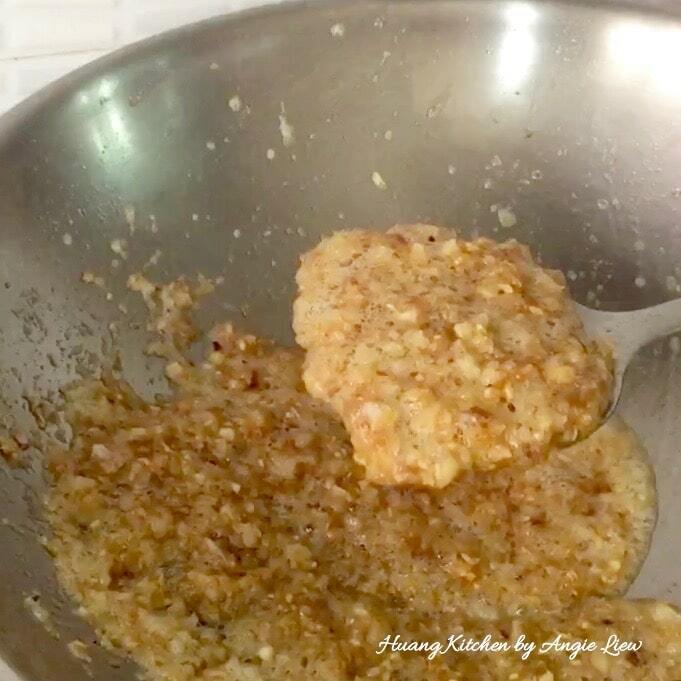 Then, bring the upper half (left side) of chive dumpling forward and press to seal. 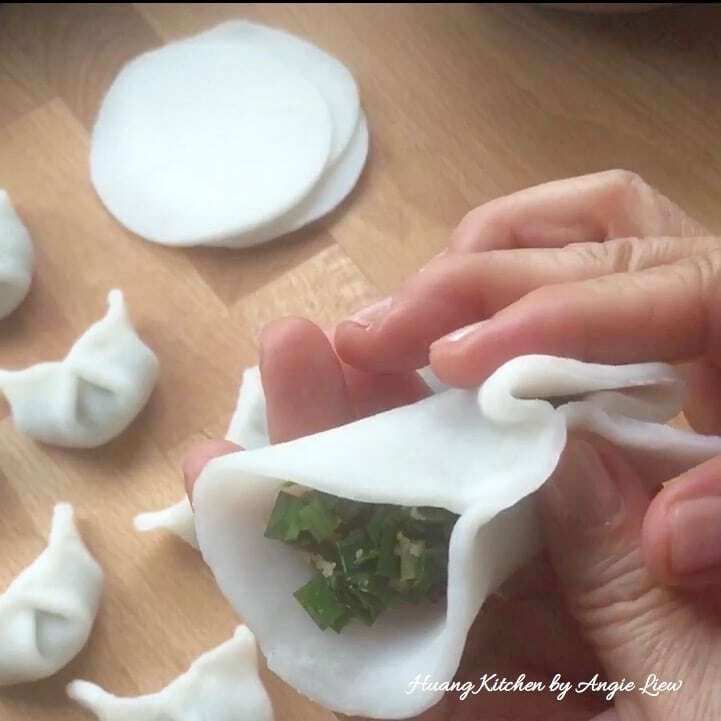 Press together both sides of chive dumpling to wrapped it up tightly. Continue to do the same for the rest of the round wrappers. And we're done! Lightly oiled a steaming tray. 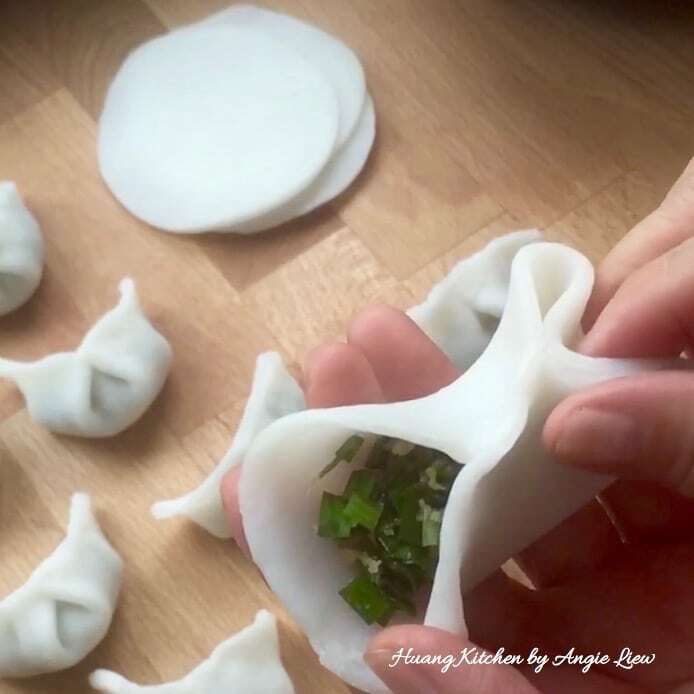 Arrange the pleated chive dumplings on the steaming tray. Steam for 15 minutes or until the skin turns translucent. Remove from steamer onto a wire rack. 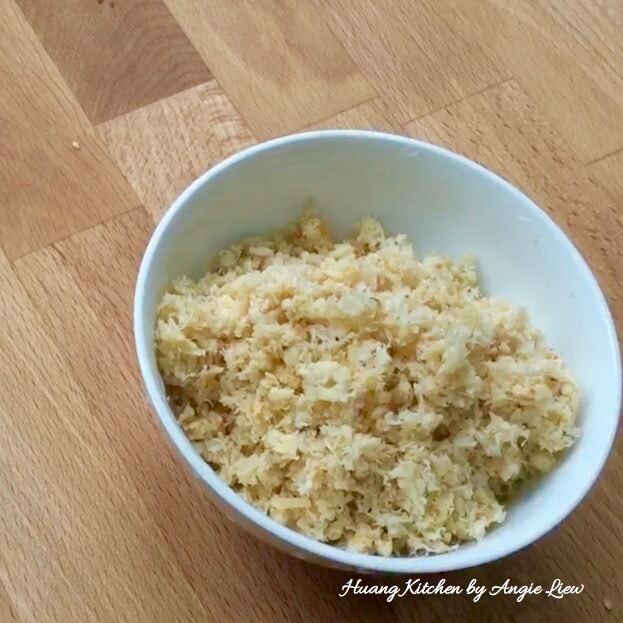 Brush with some garlic oil and leave to cool a while before transferring to a serving plate. 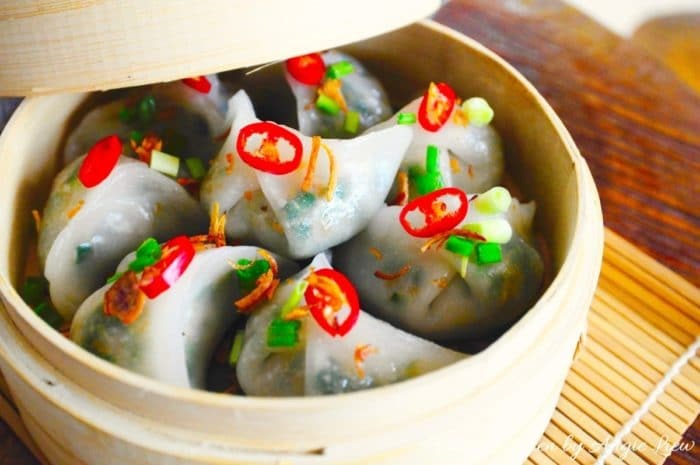 These chive dumplings are best eaten fresh served with sweet chilli sauce. So Enjoy! 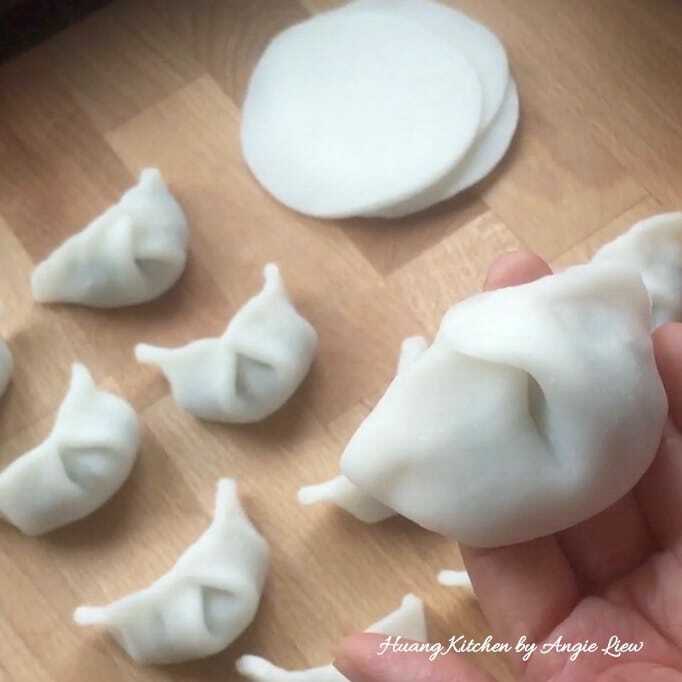 If its your first time making dumplings, use less filling to make the folding easier. The skin or crust of the ku chai kuih can either be transparent or white. If white is preferred, use more rice flour than wheat starch. 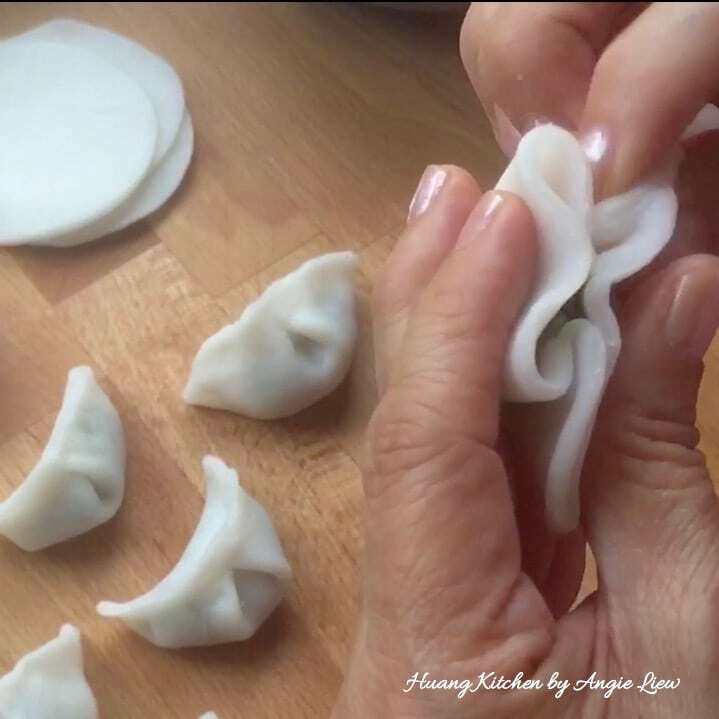 The crystal like dumpling with transparent skin is the result of more wheat starch used. 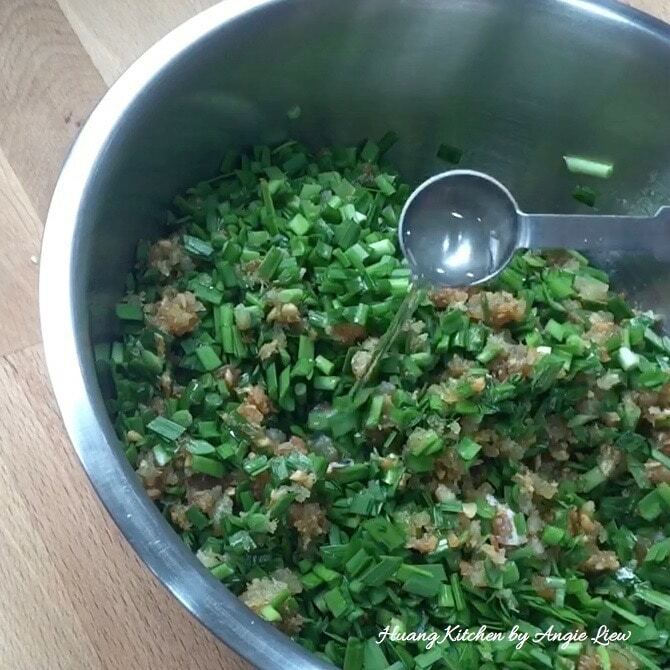 For the fillings, you can also choose to use only chives and dried shrimps and it will still taste as good.